St. Louis, MO / Destin, FL: The Kill Cliff Destin Marathon and Half Marathon in Destin, FL, successfully provided 1,350 participants from over 33 states and 4 countries accurate results and 85,696 race day photos through the use of the Innovative Timing Systems Jaguar timing system, and the ITS YOUR RACE results platform. • Free Mobile App – Easy registration, race results and photos. • Runner Tracking – Friends and family can follow a runner throughout the race. • Live Results – Online and mobile results instantly. • Live Photos – Real-time athlete photos available. • Social Media Buzz – Share results and photos on Facebook and Twitter. Innovative Timing Systems and ITS YOUR RACE was also a part of history. 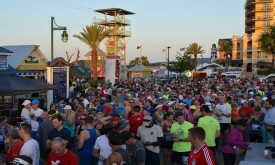 The Destin Marathon is the first marathon in history to be started through crowdfunding. This means a race created for runners, by runners. About Innovative Timing Systems, LLC: Innovative Timing Systems, LLC is a privately- owned company, providing leading-edge sports timing solutions and race timing services through a network of over 500 locations around the world. ITS provides advanced chip technologies, race kiosks, large athlete displays, live web updates, automated race photos, social media integration and mobile apps. Founded in 2008, ITS is headquartered in St. Louis, Missouri and has sales, support, and engineering facilities in numerous locations around the world.